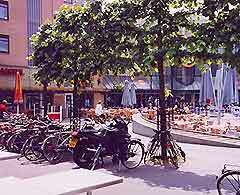 The centre of Amsterdam is a fairly compact layout with most of the sights within walking distance of one another. 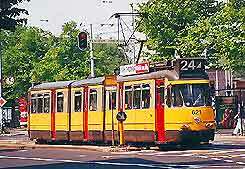 Amsterdam's public transport system is superb with trams, buses and trains providing an excellent and reliable service. Perhaps the most convenient way to travel across the city is by tram, but the fastest way is by bike, via the special cycle lanes - a method of transport used by many thousands of Amsterdammers. The Netherlands is the safest country in Europe for walking but do beware of cyclists, who seem to have their own set of rules. 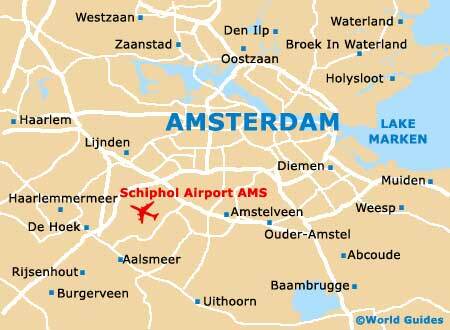 Schiphol International Airport is considered to be one of the finest in Europe and is located 15 km / 9.5 miles south-west of central Amsterdam and handles a large number of international and domestic flights. 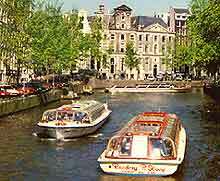 Car rental in Amsterdam can be expensive in the peak season but the best rates may be obtained by booking in advance. The rental fee usually includes unlimited mileage, plus passenger indemnity insurance and cover for third party, fire and theft, but this does not usually include actual vehicle damage. A full driver's licence is required, which has been held for at least two years without violations. The normal age restriction is between 23 to 70, but some companies may make exceptions. The Dutch drive on the right-hand side of the road and pass on the left-hand side. Right of way is given to traffic on the right in all cases and this includes roundabouts. Trams have priority at all times and car drivers should also give way to buses when they are signalling their intention to move away from a bus stop. Amsterdam has a large and reliable bus and tram service. There are also many hop on / off tours and shuttle buses, which operate in and around the city offering an ideal way for visitors to sightsee and explore the city. Tickets which cover bus, tram and metro journeys can be bought from automatic dispensers on the metro. These tickets are also available from bus and tram drivers and news-stands. A canal cruise gives visitors the chance to admire at close quarters the myriad of fascinating houseboats that line the canals, whilst enjoying wine and cheese, or perhaps indulging in a candlelit five-course dinner. This is also the optimum way to see Amsterdam's large and busy harbour. There are also water taxis, providing an alternative mode of transport to the normal taxi service. These operate along the canals calling at many of Amsterdam's top places of interest. A shuttle service links the main museums and sightseeing attractions.